Coralville welcomes RAGBRAI, the Register’s Annual Great Bike Ride Across Iowa, for the fifth time on Friday, July 24. 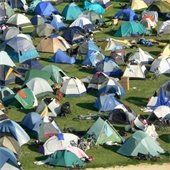 Over 20,000 visitors will arrive in the community in a single day. Options for entertainment and involvement abound, and planning will make getting to your destination easier. 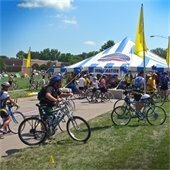 For all things RAGBRAI, visit www.RAGBRAIcoralville.com. You don’t have to ride RAGBRAI to enjoy the free entertainment. Live music, roaming acts, a kids’ zone, and indoor and outdoor movies are throughout the day. Cheap Trick, sponsored by Two Rivers Bank and Trust, performs at 8:00 pm in the beverage garden south of the Coralville Marriott Hotel and Conference Center. The beverage garden opens at 4:00 pm with live music by Slap ‘n’ Tickle, Gimikk, and The Swing Crew. Admission to the concert area/beverage garden is $10 or free to registered RAGBRAI riders or volunteers wearing their t-shirts. Coolers, food, beverages, bikes, or lawn chairs cannot be brought into the beverage garden. Food and beverages are available for purchase. Learn more. Several streets in the area surrounding S.T. Morrison Park and the Iowa River Landing will be closed or open to local traffic only on July 24 to facilitate traffic flow for RAGBRAI. Please allow extra time and use caution, especially when traveling routes used by bicycles. The addition of 20,000 visitors, many on bikes, may cause delays on city streets. Thank You, RAGBRAI Volunteers, Hosts, & Sponsors! With the help of hundreds of volunteers and housing hosts, along with community organizations and businesses, the RAGBRAI committee has staffed a multitude of volunteer shifts and housed bicyclists with true Coralville hospitality. Thank you for your time, talent, and generosity! Coralville Police & Fire Departments Rally Blood Drive Donors for "Battle of the Badges"
Work continues on 5th Street between 1st and 10th Avenues. Where 5th Street is being reconstructed and elevated over Biscuit Creek, backfill of the new box culvert and embankment fill placement, which is expected to be complete the week of July 27, will be monitored for settlement before setting a paving schedule. On 5th Street from 6th Avenue to just west of 9th Avenue, paving is expected in mid to late August. 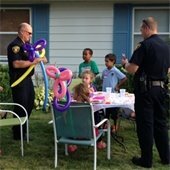 Learn more about recent progress and upcoming work at www.coralville.org/projects. Work on Coral Ridge Avenue from Holiday Road to Oakdale Boulevard continues. The goal is to have four lanes fully open before the Iowa City Community School District and University of Iowa begin classes in late August. 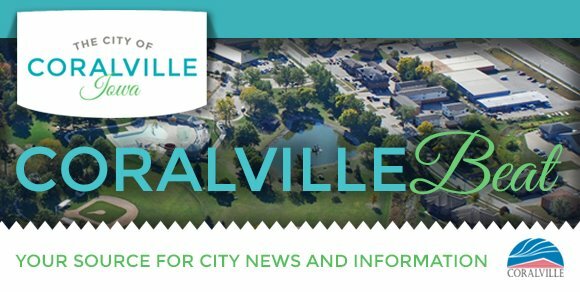 For an update on roadway lighting, brick paver installation, work on the center median, trail work, landscaping, and bioswale construction, see www.coralville.org/projects.